Fireplace mantels and even fireplaces as they are today are only associated with recent history. The fireplace wasn’t always located within the wall and wasn’t even considered for decorative purposes. Long ago, fires were used in the home for warmth and cooking. Fires were typically located in the center of the room or home in some form of pit. It wasn’t until the 12th century that the fire was moved to the side of the room along the wall. Design styles to remove smoke and increase functionality eventually led to inset fireplaces and chimneys. When fireplaces moved to the wall area, mantels were typically only seen in castles and in homes of the wealthy. In the mid-18th century, people began to decorate around the fireplace, such as with a functional shelf-type mantel and the placement of portraits above the fireplace. 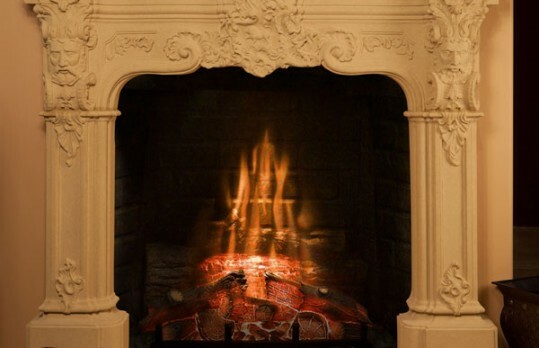 In the 19th century, stoves that used wood and coal became more popular for cooking and heating the home, making fireplaces become more ornamental in purpose. Traditional fireplace mantels and rustic fireplace mantels can take a room back in time for a more basic and functional look that goes well with any room, especially when you wish comfort to be the focus. If you are looking for a new mantel, SoCal fireplace mantels offers a large selection to choose from right in the showroom. If you can’t find what you are looking for, you can choose to work with a design expert to help create your own custom mantel.